For a team that didn't do much at the trade deadline, the Flyers sure have a lot of new faces in their dressing room these days. There's goalie Petr Mrazek, who finally lost a game Thursday night after backstopping three straight victories since arriving in a trade a week before the deadline. Alex Lyon, his backup, wasn't promoted from Lehigh Valley much earlier than that. Called up to replace Wayne Simmonds two weeks ago, rookie Oskar Lindblom came thisclose to his first NHL goal Thursday. Johnny Oduya, the lone trade-deadline pickup, finally practiced with the team Friday and will join it for this weekend's back-to-back matinees against Tampa Bay and Florida. That guy without the front teeth looks familiar. Why, it's Simmonds, who used the time he has spent rehabbing from his upper-body injury to have a few bothersome dead teeth removed. 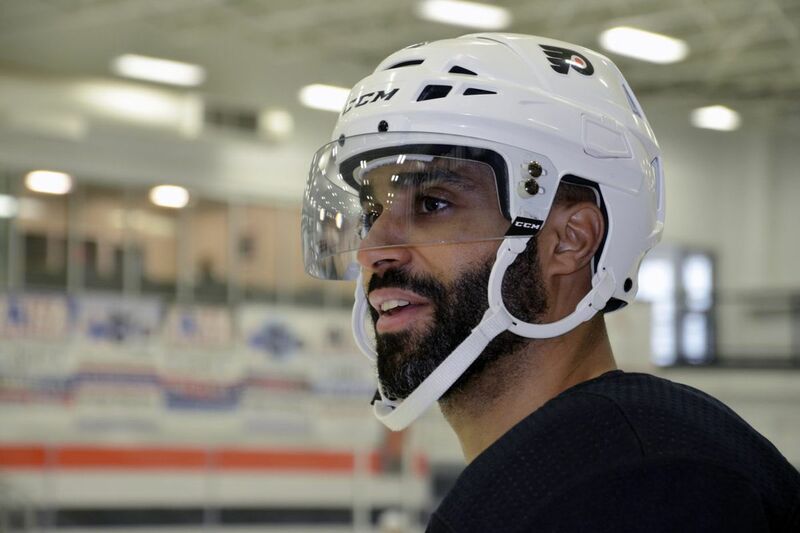 "I feel like Coots,'' he said through what was still a swollen mouth — a nod to the toothless on-ice presence of teammate Sean Couturier. Simmonds, who has been skating through his rehab, wore pads for the first time since leaving a game against the Rangers on Feb. 18 after a fight. According to an estimate given by Flyers general manager Ron Hextall on Monday, he could be available to play as soon as next weekend. "When I come back, I should have my legs,'' he said. Where does that leave Lindblom, his replacement? Probably with the team, but on a lower line. On Friday, Flyers coach Dave Hakstol praised Lindblom's play on the second line, saying, "I think Oskar has done everything but have a puck go into the net.'' But he also spoke of the importance of veteran savvy, particularly at this time of the year, an explanation perhaps for why the Flyers claimed Oduya off waivers before the trade deadline. Oduya is 36, and by his own account, "it's been a rough last couple of months'' in Ottawa, where the Senators and their fans expected to be building on their conference finals appearance of a season ago. Instead, the Senators are in seventh place in the Atlantic Division with just 52 points, one of the true have-nots in this everybody-gets-a-trophy league. And thus Oduya, who averaged more than 17 minutes of ice time in Ottawa, is a depth-position Flyer. Oduya, 36, has won two Stanley Cups with Chicago and has been involved in 106 playoff games over his 15 NHL seasons. As much as his play has been down this season, he still was a plus-2 for a bad team. Brandon Manning is a lineup regular in large part because of the inconsistencies of Travis Sanheim, who struggled as a regular before being a healthy scratch and, later, reassigned to Lehigh Valley. Lately, though, it is Manning who has been under the microscope for some costly mistakes and giveaways. Are his days as a lineup regular in jeopardy? This weekend's games should provide insight. But we'll leave you with more words from the coach on the subject. "Young guys are still very effective,'' Hakstol said. "We have young guys on our roster who will continue to play key roles as we go through the year, most likely larger roles than they are now as we want to continue to grow as a team.